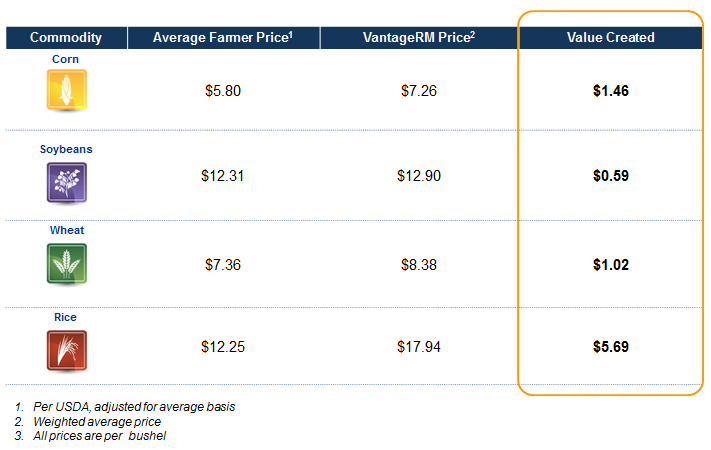 We help farmers manage market risk. It is our job to make sound recommendations based on thorough analysis and the many years of experience we have managing market risk. We let you know exactly what marketing moves we are making in corn, soybeans, wheat, and rice. We categorize recommendations according to two different styles—conservative and proactive. It is our objective to provide fundamentally grounded technical analysis. This means we focus primarily on technical analysis while ensuring it fits within the context of the bigger fundamental picture. The result is a fundamentally grounded technical component to incorporate into your risk management decisions. View this video demonstration to see how VantageRM Market Watch combines eight Service components to provide comprehensive market analysis and help you mange market risk. You will see how our service is designed to efficiently and effectively communicate key information and become part of your marketing program.